The world looks very different after you are dead, particularly if you wake up in the body of a Marotte, a fool’s staff. From Lord Conjuror to the toy of the court’s fool, Vod is able to gain a new experience and way of looking at the world and his court when death causes his change of office. Set up as part of a political intrigue, Vod is better suited to carry out an investigation of the court when he is linked to the largely ignored fool. There is a benefit in being treated as a joke in that no one expects you to actually be challenge the expectations of the court. As a fool’s marotte, Vod learns more about the court, about himself, and about notions of selfless, self-sacrificing love. He is able to discover that the court fool, Cherchenko, far from being foolish, is complex, intelligent, and completely in love with him. Constrained by social position and the homophobic culture in which he is embedded, Cherchenko was forced to keep his love for Vod secret, burying his affections until Vod has become a spirit, disembodied and distanced from his rank and any cultural expectations around sexuality. He is able to be more free and open with a spirit than he had been with the man. Cherchebko’s love for Vod literally called him back from the grave, summoning him forth into Vod’s wand, stolen and disguised as the fool’s marotte. Toni Pi explores the role of the fool as a social outsider, like most social Others, both invisible (ignored and disregarded) and hypervisible, constantly noticed for his Otherness. Cherchenko uses his status as someone who is disregarded to engage in political intrigue, knowing that he won’t be taken seriously or viewed as a political player, but that invisibility also meant that Vod, while alive, ignored the fool, disregarding him as all of the others did. It is only in Vod’s new position as ghost, without his body and status and everything that lets him disregard those on the fringes that he is able to really see into the fringes, to see the relationships that exist outside of his previous sphere of attention. -Charles de Lint – “The Conjure Man” In The Very Best of Charles de Lint. Set in the future, Brandon Crilly’s “Remembrance” is a venture into the results of war, not on nations, but on one family. Since returning from war, Anna’s father has used an assemblage of assistive technology including a bionic prosthetic leg, but more importantly, a new technology that is purported to help soldiers cope with Post Traumatic Stress Disorder (PTSD). This technology allows a soldier to visit friends lost in war by simulating them in a virtual world. Anna fears that the assistive tech her father is using is causing him to lose touch with reality and become addicted to his technology. She feels him slipping away from her as he engages more and more with his virtual world. She ponders whether the technology is helping or hindering his metal health. It is only when Anna is able to think about her own experience of loss, the trauma that she suffered when her mother died, that she is able to understand her father. This common experience of loss lets her enter into a shared space of longing and constant coping. Crilly provides no easy answers or simple resolutions, but rather shows that trauma and loss are always negotiated, ongoing processes for families to work out. 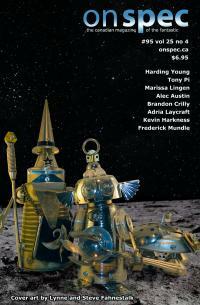 A review of Kevin Harkness’ “Double Vision” from OnSpec # 95, vol 25, no 4. Truth is painful, and seeing the truth is a huge responsibility. Kevin Harkness’ “Double Vision” peels back the layers of fiction in our society, exposing the social masks and lies we create for ourselves and others – an important part of this process we call “civilisation”. When Chartrand was in a mining explosion, pieces of metal and rock were thrust into his brain, severing it into two halves. This doubling of cognition allowed him to simultaneously see and hear two different visions and sets of words – one, the words that were said and the attitude performed by a person, and the other their true face and the words that they conceal. His doubled experience allowed him (or forced him) to see the difference between the performed world and the inner, hidden world, creating a painful cognitive dissonance and a general alienation from an all-to-often fictional society. Harkness takes the reader into this realm of duality, letting us see how much of our world is fictional, performed, and inauthentic. In this space of question, Harkness exposes not just individual secrets, but the way that communities ignore or hide problems to make things appear better on the surface, erasing difference, removing members of a community that differ from the values that are entrenched as the “norm”, and concealing issues of violence and abuse because they are “private” rather than public affairs. Through Chartrand’s dual vision and dual hearing, the reader is pulled into a place of social question, asking what has been concealed, what hidden, what erased to make communities appear to be homogenous. Speculating Canada is going On Air on Trent Radio for the summer. I will be on air every Monday at 8:00 (EST) throughout the summer starting next monday (April 28th). The summer radio show will be a mixture of discussions of Canadian speculative fiction (horror, fantasy, science fiction, and the various speculative genres in between) and interviews with Canadian speculative authors, allowing them to share their perspectives, thoughts, and ideas. Next Monday, Speculating Canada on Trent Radio will begin with a discussion of Canadian zombie fiction, highlighting the diversity of the genre and focussing on texts that do something a little bit differently with the zombie. If you are in broadcast range, Trent Radio can be heard at 92.7 FM, and if you are outside of our broadcast range, you can live stream Trent Radio at http://www.trentu.ca/org/trentradio/ . The Religion of Blood Medicine. Rich Larson’s “Maria and the Pilgrim” explores a future in which contagion has spread and a small group of people have applied religious meanings to the spread of disease. Seeing themselves as preserved by Jesucristo against a contagion spread by the devil, this group of survivors have sought a pilgrim. As part of their religious dances, this religious group gives blood, allowing machines to pull forth sanguine liquid, offering it to pilgrims in the same way as they believe Jesucristo gave it to his followers. The pilgrim, however, uses the blood to test children for plague resurgence and health, determining the healthy development of the community. This is a community shaped by eugenics, made to conform to a breeding programme due to the threat of Contagion. Health is policed, controlled, and regulated, permitting little variation from a set programme. Any children born without a membrane in this world are supposed to be exposed, left for dead, but this community wants the pilgrim to heal a child, restoring her membrane to help her survive. In exchange, they promise not to slip open the pilgrim’s membrane to give him the Contagion. This is a future where even aggression is seen as considered genetic and an accusation of genetic aggression is enough to have a village sterilized and culled. Religion and health combine in a system of control and regulation, shaped by a fear of exposure to disease. Life is regimented and controlled, and the body is a subject of policing. The policing of the body from a religious and medical perspective are intertwined in Larson’s narrative, exploring the multiplicity of bodily control that our social systems can impose. Fear becomes a powerful motivator for bodily regulation and control, allowing a population to submit without revolutionary thought. Some of Rich Larson’s publications can be found at Amazon.com/author/richlarson.